In the year 800 BC, you could earn a king’s fortune by making something good, perhaps with new materials or a new technique, putting it on a ship, sailing it around the Mediterranean, the Adriatic and the Black Sea, and either trading it or selling it. Most of us don’t think of inter-cultural commerce when we think of 800 BC. It’s more likely we think of benighted barbarians. Of course, we’d be wrong. In the 4.5 billion year history of the world, 800 BC is like yesterday. Much of what was done then is still being done today. (Look at the button on your shirt. It’s 5,000 years old.) What is sad is that we don’t know as much about that time as we should. There was an early civilization back then that excelled at trading, culture, technology and wealth accumulation. Comparatively little is know of them. They were the Etruscans, and I’m one of them. 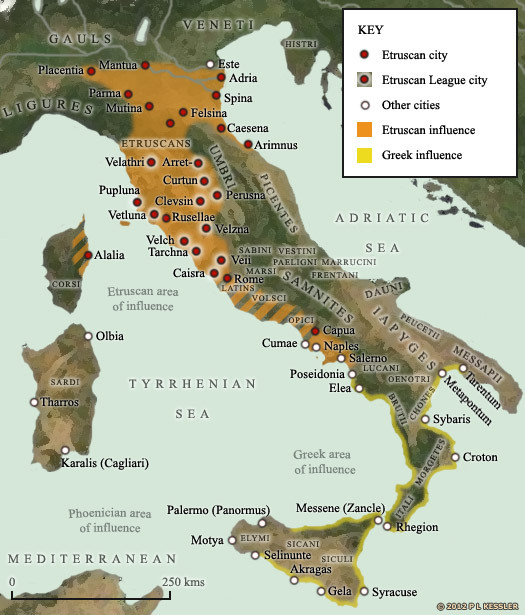 If your ancestors are from the Tuscany region of Italy, where the Etruscans lived, you might call yourself Italian. 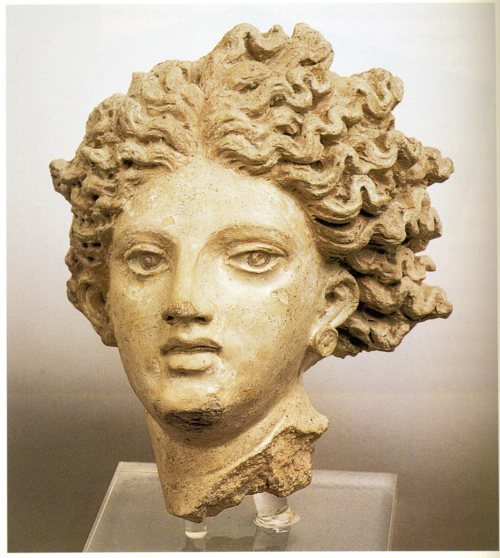 But I’m finding that more and more people in this category are starting to classify themselves as Etruscans – the civilization that pre-dated Rome and for a time coexisted with Rome; the civilization from which Rome borrowed and then moved ahead, absorbing and eliminating its once great rival. Much of what we do know of the Etruscans comes from the ancient writings of Greeks and Romans, who had nothing good to say about them — a sure sign of envy and jealousy. The Greeks and Romans criticized the extravagant Etruscan lifestyle, the culture’s public display of affection between men and women, and a then unprecedented equality between the two sexes. At a recent party I spoke to an Etruscan friend of mine, Franca. She was born in Florence, in the Tuscany region. In a heavy Italian accent, she started talking about her ancestors and how everything that made Rome great was taken or learned from the Etruscans. She scoffed at the Roman warriors who battled in chariots. “Chariots were designed by the Etruscans for women,” she said. Franca is a rare human being who by chance became my friend. She’s a marvelous storyteller. She knew Pavarotti before he became famous. He used to cook for her in his tiny New York apartment. But that’s another story. While I had been aware that Franca was a fan of the ancients – she has a ring made from a coin that predates Christ — I didn’t know until this party that her son, a college president in Switzerland, spends every summer digging at an Etruscan excavation site. He is an expert on these people. I’m unsure if he taught Franca or if Franca taught him. The discoveries at Etruscan sites come mainly from the findings within elaborate burial tombs of the rich. 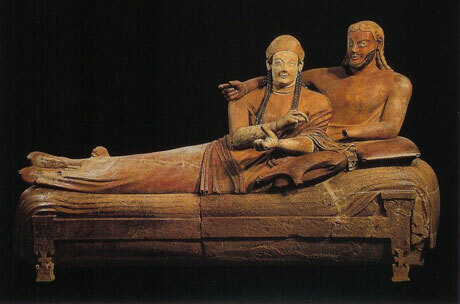 The Etruscan elite had the habit of building tombs that were detailed copies of their aboveground homes. The tombs were filled with domestic items of all kinds as well as great art objects and jewelry. This provides a window into the culture, but it is heavily curtained. The problem with unlocking all the mysteries of the Etruscans is that their writing did not survive. They had their own language and their own script, but they wrote on linen, which was easily ravaged by time. Some Etruscan writing had been found on metal and stone, but it just wasn’t enough. There often are quirks, mistakes and random or unusual acts that end up having a profound effect on history. This mummy is one of them. I learned of it not from Franca but from a Time-Life book called, “Etruscans: Italy’s Lovers of Life.” The story, with many twists, begins in the late 1840s when a Croatian noble named Mihael de Barc visited Alexandria, Egypt. It was there that he bought himself a genuine mummy. de Barc took his treasure to a home he had in Vienna, and put it on display. For some unknown reason, he found it necessary to slowly, over time, unwrap the mummy. By his death in 1859, he had completely unwrapped it. Stay with me, please. I’m getting to the Etruscan part. An executor put the exposed corpse and the bandages – which contained indecipherable writing — in separate cases and shipped them to the National Museum in Zagreb. In 1891, someone figured out that the unraveled linen actually was an Etruscan book. The only way to explain this is to assume that an exiled Etruscan had once settled in Egypt and a mummy-maker grabbed one of his books to use on a client. As mummification preserved the body, it also preserved the linen. This chain of events, so far-fetched it could never pass for fiction, has given the world the only surviving Etruscan book. And still we don’t know enough. Whenever I read more about these ancient yet modern people, my fasciation grows. The Etruscans called themselves by a name not used by others. To them, they were the Rasna or Rasemma. The Greeks called them Tyrrhenoi (from which we get the Tyrrhenian Sea). It was the Romans who called them Etrusci or Tusci (from which we get Tuscany). They were great engineers, known for their roads and ambitious irrigation projects. Skeletal remains show they were exceptional dentists. (The design of the bridgework found in the mouths of tomb cadavers is still used today.) Their great wealth was the result of their talent at metalworking and the fact that they controlled vast deposits of copper, iron ore and tin, the largest in that area of the world. This was the stuff that went on their ships and gave them the foundation for one of the Western world’s greatest early civilization. If only they had written on something more substantial than linen. Anyway, I’m optimistic more information will be forthcoming. Franca’s son is sure to keep digging, so I may know more by the next party. But I doubt they will ever find another mummy that’s a book.